Wow. What can I say, Jeff Permanian brought his "A" game to the show. The system showed what you can do with a HTPC, madVR, Jriver, a good DAC/audio interface, a pair or Lab Gruppen amps, and seven ginormous full-range superspeakers—the Noesis 215RT. Oh, and Seymour Screen Excellence Enlightor-Neo screen material made its debut in this very room. It has no visible texture, even if you pixel-peep. sonichart, darthray, Jeff Permanian and 11 others like this. Last edited by imagic; 04-28-2017 at 11:54 AM. Subs? Where we are going we don't need subs. 128dB per speaker should be able to getter done and no WAF worries about subwoofers. Since I'm sane, I'd use the JTR 228HTR for surrounds and hide the big dogs behind the screen. I do like the LABGruppen 4 channel amplifier though, with smaller surrounds I could get by with one of them with the 4th channel to drive a sub in the back to even things up. Good to see someone hoist the pirate flag and get their IMAX on. Now for Seton Sound, the battle of the titans continues. Thanks for making me feel not worthy. bbibb, murphy2112, Jeff Permanian and 2 others like this. I wasn't able to stay as long as I would like but this setup was amazing. I couldn't believe how smooth the bass was. Jriver 22 was also impressive. Well done, Jeff. Jeff Permanian and Last Mile like this. This was an amazing setup at the show and my favorite of the day. Jeff's setup was amazing to listen to. These speakers will be my next upgrade in my room. I got the chills listening to Star-Spangled Banner that day in the room. Well done Jeff P.
murphy2112, Jeff Permanian and ninjahifi like this. Do you happen to know where I can get that? I should have mentioned, I saw that clip too and wow. Awesome!! I bet it was amazing! JTR is the real deal! Ive always thought large, full range rears were the way to go. I missed this year and now wish i did not.The speakers above are replacing 2 Acoustic research AR-9's matched to 2 Velodyne subs. I have Niles as my surround which are full range but i am going to use them as high wides and the Ar's for rear surrounds. That's all I know and read that from the JTR thread of what demos they played in the room. sonichart and Jeff Permanian like this. Mark, I'm glad you enjoyed the room. I was hoping to spend some more time discussing the room calibration when you were there, but some customers walked in. The video was calibrated with my Colorimetry Research CR-250-RH and CR-100 combo using CalMAN Professional. I did the initial calibration using my Murideo Fresco Six-G pattern generator and followed that up with a 3D LUT using madVR as the pattern generator and display. It is from Hillary's America which is available on Amazon. thehun, imagic, Jeff Permanian and 1 others like this. Last edited by darthray; 04-25-2017 at 08:27 PM. They should be for 3x's the price). Sometimes I will go down to listen to a couple of songs on the 215RT's and the next thing I know it is 3am, I get lost in the music with these speakers, it is so hard to turn them off sometimes. The PSA speakers sound wonderful as well, but they don't captivate me for 5 hour listening sessions. Here are pictures of both speakers together. rcohen, darthray, RMK! and 15 others like this. Last edited by raynist; 04-25-2017 at 09:08 PM. RMK went from dual JTR Orbit Shifters to just three of the JTR 215RT's in his system last year and prefers the 215RT's bass as more articulate and cohesive. 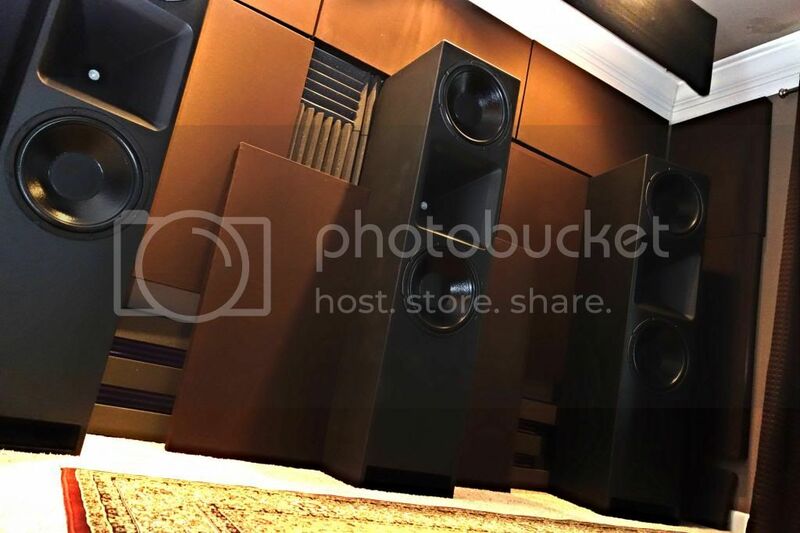 He said they were the perfect full range speaker with phenomenal detail for music and extraordinary dynamics for home theater. I've been salivating over these ever since. I almost bought tickets to Chicago just to hear this setup when Jeff first posted his plans it in the JTR thread a month ago, but work and family plans got in the way. Jeff may be bringing this same combination to THE Show Newport in September. I'm really looking forward to hearing this system. That gives me five months to save up for a show special! dholmes54, darthray, RMK! and 5 others like this. Nice writeup Mark. There are several of us on the Forum with 215RT's. No one has 5 let alone 7 of them so the AXPONA show provided a rare and very cool experience. As someone who really wanted full range speakers, the 215RT's are a perfect match for my room and application. As mentioned above, separate subs are not required or in my case, desired. 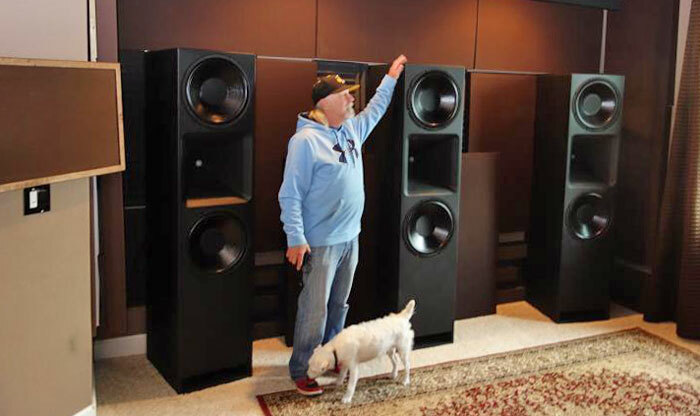 Please make a trip to California Jeff i've been wanting to hear these speakers for years. Jeff Permanian and Peterc613 like this. RMK is in Sacramento and I'm moving to Redding. 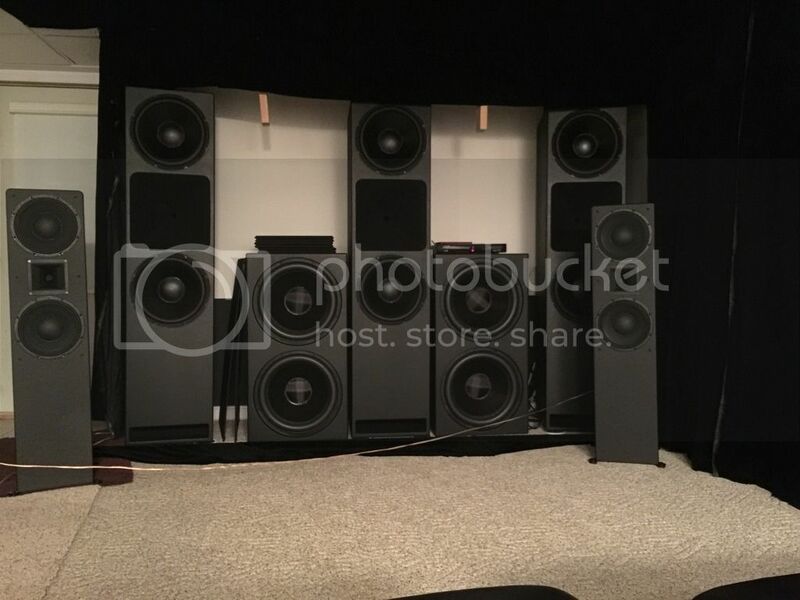 From the short video, it said each 215RT has dual 18" woofers, I thought those are dual 15" woofers? Ooops. Will fix typo and upload new clip. Uh-oh, did Mark just spill the beans on the upcoming JTR 218RT? @chriscmore Whoa whoa whoa, Enlightor Neo from Seymour? chriscmore and Jeff Permanian like this. I am also very interested in this Neo Screen material.... Anyone know anything about it? I've had the pleasure to hear JTR 215RT at a members house. They are worth the price & on another level then most speakers....Trust me they don't need sub woofers.Once you hear them you will never forget the sound. Jeff Permanian and eng-399 like this. Now I need four more! I am thinking that might be me!! That amount of bass had to be impressive, it would be like having 25 ish SVS PB-13 Ultras in 20hz mode! What I'd like to hear from people that were there is this: what were your impressions of having truly full range surround speakers compared to crossing surrounds at 80hz? I have never experienced it. I could have many times - even in my own room I could have set up the 215's as side surrounds - but I never did it because I didn't want to fall in love with it because it wouldn't be realistic to set up the room that way. @Archaea I'm sure you'll post your impressions of Axpona in general and the JTR room specifically on the KC thread, but you should include the stuff about the 215's on this thread too. It took two vans and two trailers to hauler everything down. Attached are a couple pictures from other areas of the demo room. A show like this doesn't just happen in one day by one person. Michael @desertdome of High Impact AV and I spent months planning, calculating, coordinating and then days loading, traveling, setting up and calibrating. After dinner on Saturday Michael went back to the demo room and working on til 1:30am calibrating the projector. The room definitely wouldn't have been what it was without High Impact AV's help. I've been staying away from 4k video because ignorance is bliss but I got "stuck" watching 4k content for a few days and now I'm spoiled. That new Enlightnor NEO screen from Seymour was amazing! It didn't have any visual flaws and is their most acoustically transparent screen. The JVC RS4500 was ridiculous. We watch a 4k demo of Chicago, you could see details a mile way and it seemed like I could walk up and see my reflection in the side of the train car. It was that real. cannga, chriscmore, RMK! and 5 others like this. Last edited by Jeff Permanian; 04-26-2017 at 10:33 AM. A single 215 RT is VERY similar in output to a JTR Captivator 1400 - actually a bit more. I've owned dual Cap subs and also a pair of 215 RT's. 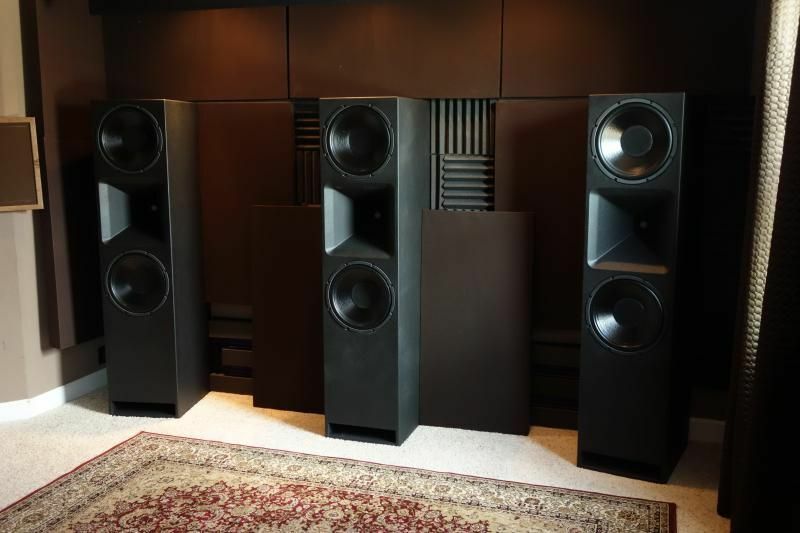 Wow that is astonishing, would these monsters work in my 2100 cuft room as left and right channel and with me forgetting about the subs? What would they need to power?